With December here, and the cold weather on its' way, many of us suffer from drier skin. Well, in addition to dry skin, winter can cause dry scalps as well. To prevent this, I thought I'd try out Lush's Fair Trade Honey* shampoo! This is a new product from Lush, and I was really excited to try it out. I've been using Lush's Ultimate Shine solid shampoo bar for about the past month or so, but I wanted to see if I could find something a bit more hydrating. 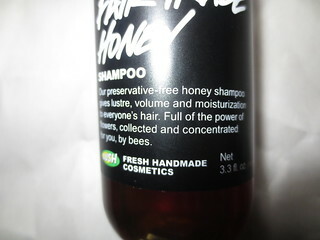 "Over half of this shampoo consists of Fair Trade honey, which is beautifully moisturizing and gives hair shine and luster. All that honey has allowed us to make this one preservative-free, too! While 50% is honey, 20% is linseed mucilage, which has a lovely texture and is moisturizing and conditioning. Fair Trade Honey is suitable for almost everyone, but with all these moisturizing ingredients, it is specifically lovely on hair in need of moisture." I have really thick, dry, long hair, so I normally turn to my conditioner for a surge of moisture. However, I found Fair Trade Honey really moisturizing! I only needed a small amount to form a great lather on my scalp. I worked this into my hair, and then rinsed it away. I then followed up with Lush's Happy Happy Joy Joy* (reviewed here). 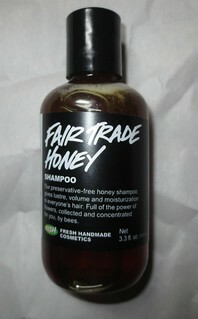 I find that when I use this Fair Trade Honey shampoo, my hair is left feeling softer and more manageable, with less frizz. If you have dry, damaged hair, or if you just love the sounds of a moisturizing shampoo, I would definitely check this one out. Lush's shampoos are quite pricey, as a 500ml bottle will cost you $29.95. But, you need such a small amount to create a large lather, that a bottle that size should last you ages. Also, I recommend checking this out in a store, since the scent is fairly strong. And as always, you can ask for a sample to try it out before splurging! This shampoo sounds awesome for this time of year!! great review! might have to go check this out! What conditioner do you pair off with this? It sounds lovely!